Janhvi Kapoor shares a close relationship with her father Boney Kapoor and the actor earlier revealed that she gets her outfits approved by her father since that gives her confidence. Janhvi made her big Bollywood debut with Dhadak opposite Ishaan Khatter. The young actor is also a fitness enthusiast and has been spotted quite a number of times outside her gym. 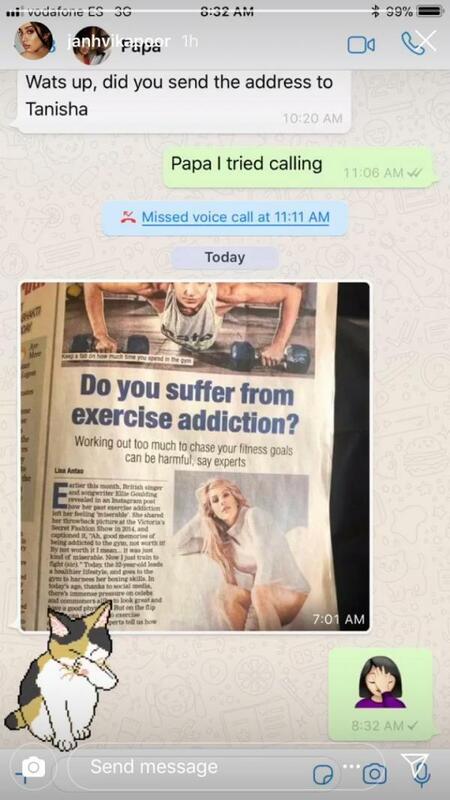 Recently, Janhvi shared a screenshot of the hilarious conversation she has with her father regarding her fitness. Janhvi, took to her Instagram story to share a screenshot of her Whatsapp conversation with her father Boney Kapoor where Boney can be seen pulling his daughter’s leg. Boney had sent her an article with the headline, “Do you suffer from exercise addiction?” Janhvi replied to this with a ‘palm on the face’ emoji. Well, Janhvi’s expression is every youngster’s reaction to parents WhatsApp conversation. Janhvi made her big Bollywood debut with Dhadak with Ishaan Khatter. Though the film got mixed reviews from the audience, her performance was praised by many. Her fans are now eagerly waiting to see her in her next film. Talking about her fashion game, the young actor has always left the fashion police impressed with her incredible dressing sense. Seems like she is following her older sister Sonam’s footsteps when it comes to fashion. On the work front, Janhvi is busy with the preparation of her next film, Dharma Productions’ Takht. The film also features Ranveer Singh, Kareena Kapoor Khan, Vicky Kaushal, Alia Bhatt, Bhumi Pednekar and Janhvi’s uncle, Anil Kapoor. It’s Karan Johar‘s next big directorial and is going on the floors from mid-2019.